The family of one of the IRA’s “disappeared” who was finally buried on Friday, 36 years after he vanished in Belfast, have appealed to republicans to help find those victims still missing and presumed dead. The call was made at the funeral of Brendan Megraw in west Belfast, who was kidnapped, killed and buried in secret by the IRA in 1978. A priest told mourners that Megraw’s mother, who died in 2002, had prayed for the day when her son would have a Christian burial. Father Aidan Brankin said Megraw’s family and friends were still praying that those still missing “too will soon be found”. Brendan Megraw was abducted at gunpoint from his home shortly after he had married his pregnant girlfriend. Earlier this month, the organisation tasked with finding the “disappeared” confirmed that remains discovered by specialist forensic experts in a Co Meath were those of Megraw. The Independent Commission for the Location of Victims’ Remains is currently searching for another missing man, the former Belfast monk Joe Lynskey, who they believe was buried in the same Oristown bog as Megraw. 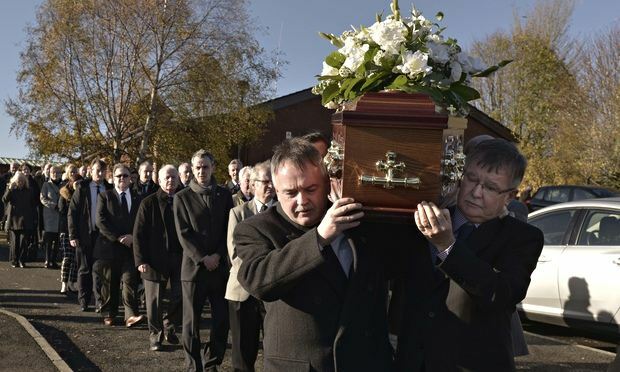 During his homily at the requiem mass in St Oliver Plunkett church in West Belfast, Brankin said Brigid Megraw “prayed for this day, when Brendan was found and he could have a funeral and be buried in the family grave”. He added: “Unfortunately, she didn’t get to see that prayer answered, but it is answered today. She wasn’t just praying for Brendan. She prayed for all those who had been taken. Six of the “disappeared” are still missing – five of them killed and secretly buried by the IRA. They include SAS captain Robert Nairac who was abducted, killed and buried in secret in South Armagh. The sixth, the only non-IRA victim, was Seamus Ruddy, an Irish National Liberation Army member who was murdered in Paris and then secretly buried somewhere in the French capital. Ruddy was killed as part of an internal INLA feud by a rival faction that kidnapped and tortured him in order to find out the whereabouts of arms and explosives in France destined for another rival grouping in the fractious republican socialist movement.